Hopwood-based artist Paula Hamilton looks at historic christening gowns. I never used to be quite sure how I felt about the Royal Family, but in recent years I have to admit I have become a pretty big fan of theirs. I was interested to read recently that the Midlands favours the royals more than any other region of the UK, with 89 per cent supporting the monarchy; the UK average stands at 80 per cent. Perhaps the popularity of the Royals is boosted because we’ve experienced a collection of rather joyful Royal events recently, with Will and Kate’s wedding, the Queen’s Diamond Jubilee and now the birth of a tiny new Royal – Georgie, as Grandpa Prince Charles reputedly likes to call him. Because the little Prince is due to be christened soon, it seems an ideal time to talk about this event and to have a look at the history behind the Royal christening gown and other examples of these extraordinary garments. Luckily for me, Village reader Louise Burn invited me to see her collection of christening gowns, so I now know a lot more about them. The oldest gown in Louise’s collection is reputed to have been worn by Oliver Cromwell’s daughter and dates back to the 1600s. With lace embellishments on the sleeves and handmade tucks on the bodice, it is also interesting to see where the hem has been turned up, but not cut off, to comply with the fluctuating fashions of the time. 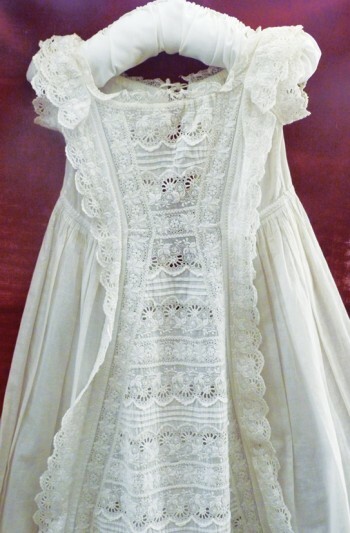 The second example is a gown from the early to mid-1800s with a panel of Ayrshire embroidery; fine and skilful white work traditionally used for wedding and christening gowns. The less skilful “dotting” stitchery may have been carried out by children as young as 10. The third gown I looked at (pictured) is the first Louise ever bought, and it’s easy to understand why as it is so pretty. Dating from the late 1800s, it is beautifully hand embroidered with tiny tucks in between. Gown four was a really over-the-top affair which Louise describes as “Gothic exuberance”. It dates from the late Victorian/early Edwardian era, and is made from fine wool, silk-lined with machine-made lace and plenty of embellishment. This makes me think about the christening of my two boys, one in dungarees and the little one in a new baby grow – the opposite of this glamorous garment! The fifth pretty gown dates from the early 1900s – it’s probably Swiss, made from machine-embroidered fine net and is shorter in line with ladies’ fashions. There is a lovely country feel about the sixth gown, which was made out of a petticoat, perhaps one that had already served its purpose, from hand-sewn cotton broderie anglaise. The bodice, made at a later date, was joined to the petticoat skirt – an early form of recycling. The Royal christening gown was originally commissioned by Queen Victoria in 1840, just a few months after her wedding to her dashing Prince Albert. Details of the actual design are sketchy but, rather romantically, it is believed to have been made from the same Spitalfields silk as the Queen’s wedding gown and trimmed with Honiton lace made by the same lacemakers who made the wedding lace. What is amazing is that this same robe was worn by each of Victoria’s nine children, many of her grandchildren, our Queen, Prince Charles, Prince William, Princess Beatrice and several other royals as well. In all, more than 70 members of the Royal Family have had their moment in the spotlight in this beautiful robe. Apparently, when Princess Anne’s son Peter was christened she thought the gown too girly for a boy, but allowed Zara to wear it! So after 167 years of use took its toll on the fragile lace and silk, our Queen finally decided that it was time to retire the original Victorian gown. She commissioned a replica, which was first worn in April 2008 by James, the son of the Duke and Duchess of Wessex. It was made by the Queen’s dresser, Angela Kelly, and the team of dressmakers at Buckingham Palace, and features the same lengthy skirt and elaborate collars and bows as its predecessor. To stop it from disintegrating, the original historic gown will presumably be carefully preserved somewhere while modern Royals, including baby George, will get to look special in the new version. I can’t wait to see the photographs. * If you’re over in Solihull you might like to have a look at some of my paintings on the wall of John Lewis’s first floor restaurant, and also in G1 Gallery in Solihull Arts Centre and Library.